Dollar Sign: The universal symbol for money. These works originate from Andy's "Dollar Bill" paintings. A friend of Warhol's, Muriel Latow, charged him $50 for a suggestion of what to paint, since Warhol claimed to be out of ideas. Upon receiving payment, she asked Warhol what he loved more than anything else? MONEY! In 1981, Warhol modified his "Dollar Bill" theme. He began screening dollar signs. These canvases are in three sizes: 10 by 8", 20 by 16", and 90 by 70". These paintings are admirable for their vivid colors, making the bolder paintings more valuable. 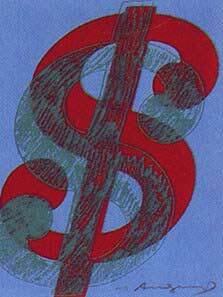 The "Dollar Sign" paintings are symbolic of Warhol's mantra: "The best art is good business".